The drawing happened last month, before the government shutdown, but Carrie Walls says the cash prize was particularly timely because her husband is a federal worker currently furloughed. WASHINGTON — If you’re going to dream about how to spend lottery winnings, the time to do it is when your husband is furloughed by the partial government shutdown. “I cried. I couldn’t believe it,” Carrie Walls, of Ashburn, Va. told the Virginia Lottery about the moment she discovered she’d won $100,000 cash and a new Ford Expedition. 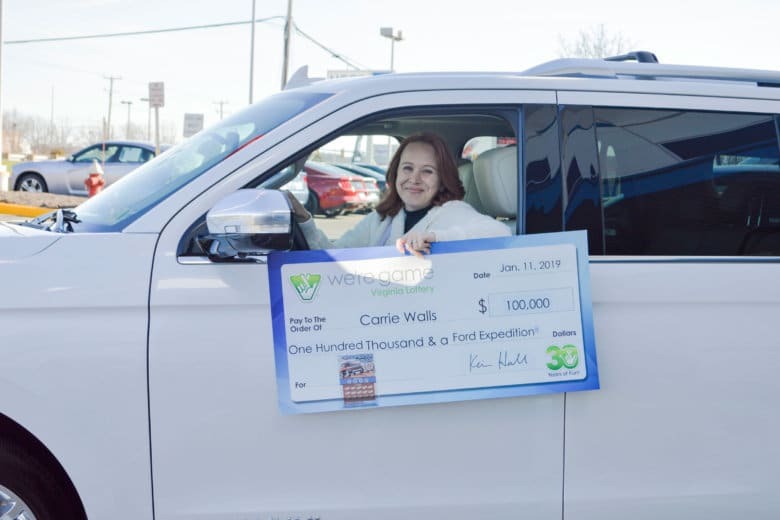 Walls won the top prize in the Virginia Lottery’s Expedition Plus $100K 2nd Chance Drawing last Dec. 4, but claimed her vehicle and prize money last Friday. Her winning ticket was one out of more than 554,000 entries. The Walls family already had a trip planned to Disney World, in Orlando, Florida. Now, they can make the trip in a 2019 Ford Expedition Platinum. Walls, a 13-year veteran of the Air Force, lives with her family in Loudoun County, which received more than $13.3 million in lottery money for K-12 education last fiscal year. The Virginia Lottery said in a statement that they generate more than $1.6 million a day for the state’s public schools.